Two years ago Alexandra, Bay Gallery Home owner travelled to the central desert community Daisy Kemarre hails from. Alexandra on a mission to find a painting for interior designer Tom Carey who graduated as 2014 Student of the Year from the KLC School of Design. Tom works in Arts and Crafts, Gothic, Aesthetic and High Victorian styles. On one of his projects he was using William Morris wallpapers but as the ‘My Country’ Lilly Green invoked William Morris comparisons Alexandra thought she could source a painting he could use in his room schemes. So Daisy’s painting became a wallpaper in turn becoming a fabric. Daisy Brown fabric can be ordered as a linen or half panama. The half panama retains the vivacity of the original work. If you want to match the wallpaper it’s best use the half panama but if you’re after a more rustic feel it works beautifully on the linen. All ‘My Country’ fabrics will be available by the metre on our shop shortly. In the meantime you can place orders with alexandra@baygalleryhome.com or call 07776 157 066. 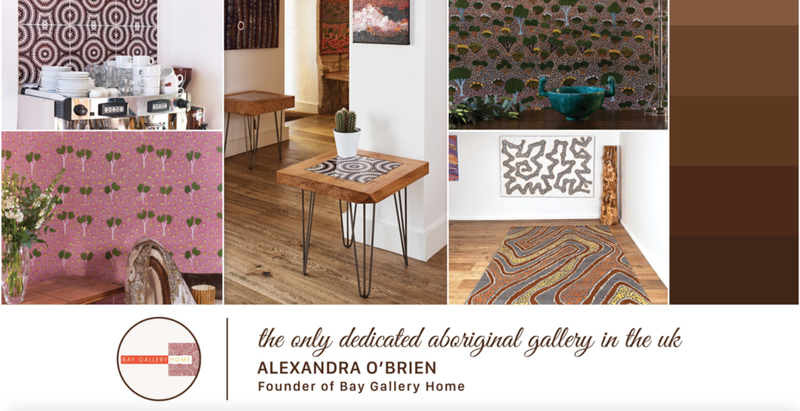 Treniq supported our 'My Country' Aboriginal interiors collection selecting it as one of ten brands featured on their stand at Decorex International and London Design Fair 2017. Interior designers can find our products across the Treniq platform where they can set up a trade account with Bay Gallery Home. Treniq mood board featuring products from our award winning 'My Country' Aboriginal interiors collection made in the UK. To see our new artwork please go to the online Art shop. The paintings can be bought online or in our Tetbury, Cotswolds gallery. 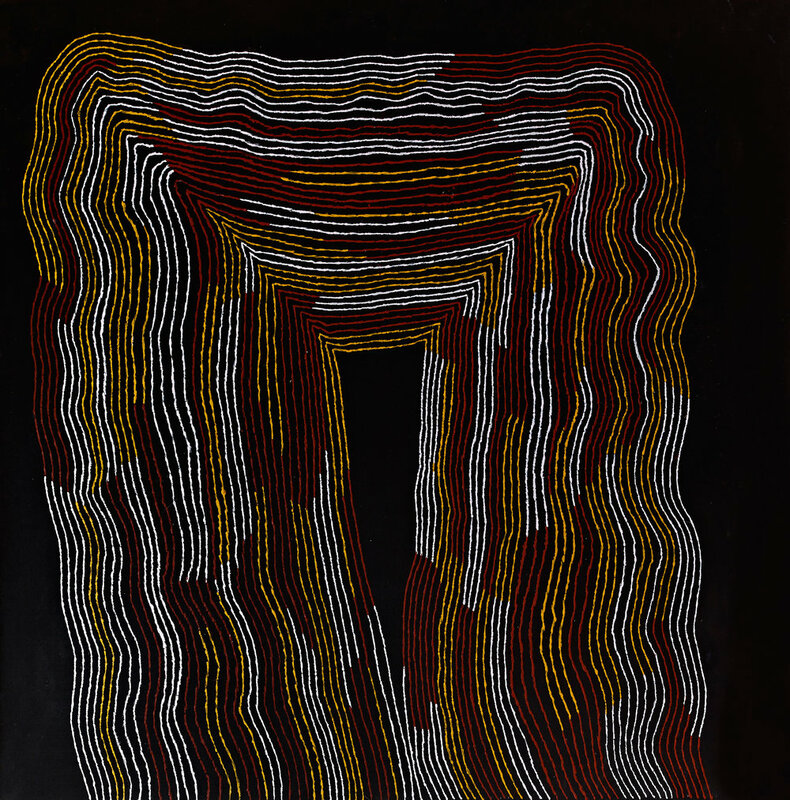 We have some really fantastic new paintings by established and emerging artists; Bay Gallery Home is particularly excited about Steven Jupurrurla Nelson's flourishing career - his paintings exude the energy of Jackson Pollock, the expansive work of Flora Nakamarra Brown and the beautifully detailed Seven Sister's Dreaming paintings Justinna Napaljarri Sims is producing. Our wonderful My Country ceramic wall tiles have been reduced as a special Christmas gift to our clients. Please get in touch if you'd like to order at £20 off per tile over the Christmas period. Or you can order online at www.baygalleryhome.com. Our innovative Bush Onion 2 tile sequence lets you create your own artwork: perfect for bathrooms, kitchens, pools and summer houses.